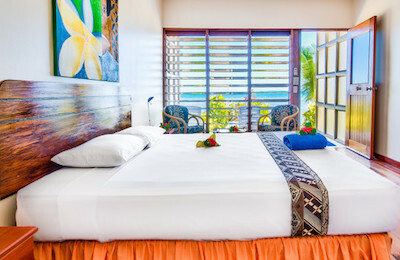 Fiji Surf Resort - Nadi, Denarau Guests overall rating: ★★★★★ 4.6 based on 5 reviews. At the Fiji Surf Resort you will be living in a real paradise among these amazing sceneries in the south pacific Ocean..
A floating restaurant overlooking the legendary surf break of Cloudbreak.. A private island resort with a plentiful proposition of fun and entertaining activities.. Amazing sunsets.. Delicious meals .. and a luxury modern ocean front accommodation overlooking the crystal clear water of Fiji. Included in the price you will have canoe, kayaks and snorkelling equipment in addition to the resort amenities: swimming pool, bar, restaurant, volley ball and the whole private island at your fully disposal for your complete relax! The Fiji Surf Resort offers you private and shared accommodation with air conditioning, Wi-Fi, full board accommodation, daily transfers to the best surf peaks of the area (less than 30 minutes via dhoni transfer) dinner at beach restaurant and evening entertainment! The staff will be waiting for you at the Nadi International Airport on Viti Levu main island (only 19 kms far) to bring your partner, friends or family to the soil of your accommodation at the surf beach resort with boat transfer. 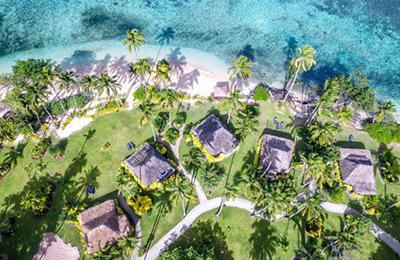 Situated on an exclusive private island entirely dedicated to our special Guests, the Fiji Surf Resort offers different types of accommodation in front of the ocean with all the comforts and amenities you may need to enjoy your stay in Fiji ! Will be a pleasure from our staff welcoming you with a fresh drink after a long trip to get to this paradise! Free use of canoes, Kayaks and snorkelling gear along the whole stay of a minimum 4 nights. 6 Beachfront bures.. literally on the beach, with all the amenities you need (refrigerator, tea/coffee maker, sun loungers,bed linen etc.) and capacity of 4 people. Ensuite bathroom and A/C or ceiling fan, private deck outside of the doorstep. 16 Ocean front private rooms A/C.. with the beach and the ocean outside of your door, you will enjoy the amazing sunsets in Fiji from your private deck ! The room with modern architecture and all the amenities (fridge,private balcony, tea/coffe maker,bed linen, sun loungers) has air condition system. Available for single, double and triple occupancy. 16 Oceanfront bures.. if you want sleep and wake up in front of ocean these rooms will give you the best experience of your entire life in Fiji! 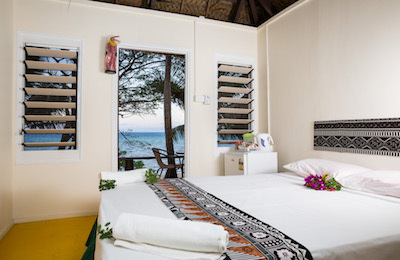 With stylish fijian decor these airy and spacious room with same features (ceiling fan, fridge,private balcony, tea/coffe maker,bed linen, sun loungers). Available for single, double and triple occupancy. 1 Shared Dorm.. with 9 bunks bed.. with hot showers. Fan Cooled. Private keyed lockers for girls only and 2 shared dorms with 16 and 12 people female and male separated side, toilet and shower facilities. Daily surf transfer to Cloudbreak, Restaurants, Nomotu Left, Wilkis Passages, Swimming pool etc.. Warm water all year long.. awesome reef breaks and beautiful scenarios inside and outside the water are just three good reasons to surf in this tropical paradise ! From 2010 most of the surf breaks that once were only exclusivity of some resorts are now accessible and surfable if you have a boat support ! These surf breaks are very consistent during the whole year, with their hollow and powerful tubes that breaks over the coral reefs keeping up with a 12fts (4mt +) swell size. 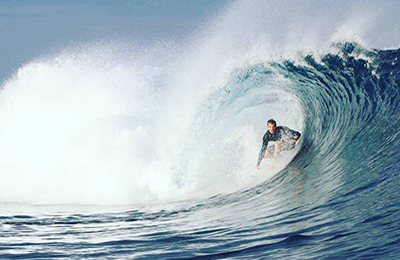 The surfcamp, thanks to its position west of Viti Levu main Island, is very close to the most famous Namotu and Tavarua (every year it hosts the World Surfing Championship Tour for the Fiji Pro Volcom event). CLOUDBREAK 20 min. by boat left hander – reef break Rated among the best waves in the world this long fast and barreling left hander wave is the ‘waterpark’ for experienced surfers! RESTAURANTS 20 min. by boat left hander – reef break Second only to Cloudbreak for the pefection of its barreling hollow and fast sections is a very challenging wave with less swell options. NAMOTU LEFT 15 minutes by boat left hander – reef break Considered the alternative to Cloudbreak is a top class wave suitable for intermediate to experienced surfers. WILKES PASSAGE 12 minutes by boat right hander – reef break Regular right hander surf break suitable also for intermediate surfers looking for uncrowded long rides. Underestimated by many is considered give its best with mid and high tide. SWIMMING POOLS 15 minutes by boat right hander – reef break Friendlier surf break compared to its ‘companions’, this right hander wave can be surfed with all tides and level. Once know as the Cannibal Isles, because of its ferocious natives, this South Pacific archipelago is now one of Oceania’s most popular destination. First settled by the Polynesians and later colonised by the British, the Fiji Islands were put on the map by Captain William Blight, of “Mutiny on the Bounty” fame. The archipelago comprises over 300 islands and atolls, the two major ones being Viti and Vanua Leva, both of volcanic origins and with several peaks exceeding 3000 feet. Tropical, tempered by the prevailing SE Trade Winds. Rainy season from January to March, but the island has minimal rainfall. Water temperature between 24-29º C. Most surfers wear a rash guard for sun protection and wind chill factor. You can come and surf in Fiji all the year round, but there are two main seasons for surfing here. During the winter from April to October , when normally come the bigger swells and from November to April with hotter day, less wind and more humid. For your convenience the surf resort provides a personalised transport service with meet and greet at the Nadi International Airport. The staff will be waiting for you at the Arrivals to bring you by car/bus to the boat meeting point in 15 minutes. In good conditions the transfer by boat take approximately 40/50 minutes before being brought to the surfcamp gateway from interchange atoll. *These Boat Transfers are on schedule and are subject to amendment or cancellation based on weather conditions. * Rates are inclusive of 15% VAT and 5% Hotel Turn over Tax. "Great place to go if you aim is just to get out and surf. I had a full package deal which covered transport to surf and meals which made my days and plans simple with little need for choice unless I wanted to change it up. I may have paid a bit more than need but it generally worked out having everything included. Also be aware if you choose shared accommodation space great way to meet others not much privacy if you are a couple book a bungalow. Otherwise sweet trip and staff are a great bunch"
Cool secluded place to surf! "Clean facilities, great location to base your surf trips to Cloudbreak from! " "Liked being on the island, where your close to other islands which you can see and view the sunsets. Good place to party, and relax.... Activities include snorkelling, bar stay open till late... Fiji time late. Staff friendly and the food was bloody awesome compared to other places I've stayed at. Has a good selection and meets all dietary needs and requests. Thax Chef Erick and Chef Sam Vosa for the laughs, you guys are a great team... I'm coming back for sure "
"I had a fantastic time at Fiji Island Resort, a great place to chill out and relax as well as take in some activities. The food, accommodation and staff were awesome. The sunsets from my room were amazing (Sunset Wing). I had the best Long Island Ice Tea cocktail thanks Joe :) The DJ plays great music and you can even ask for requests, you'll also get to see Pio one of the bar staff cut some shapes on the dance floor! I'd love to come back one day and will definitely recommend to anyone coming to Fiji. Vinaka!" "Just got back from there with two other friends. The island is stunning and the staff are very friendly but the manager is an amazingly helpful and friendly women! They went out of there way to make us fell at home. Fiji is great but if I never hear the term 'Fijian time' I'll be a happy women. Just don't expect anything to be on time or speedy at all. We'll be back!"